Except for the lack of Peter Hook’s distinctive bass, and a voice that at first seems out of place on Never Cry Another Tear , the debut CD from Bad Lieutenant, I would swear I was listening to a lost New Order release, or something from the Bernard Sumner and Johnny Marr collaboration Electronic. I imagine that fans of New Order and Electronic are not the least bit confused. Most have been fans since the Joy Division days, and are avid fans that are well aware of the history of all these bands. This review, though, is for those of you who don’t know. New Order, the band that evolved from Joy Division after the suicide of front man Ian Curtis, is one of the most influential alternative bands of the past two and a half decades. Many alternative artists claim New Order as inspiration, and New Order’s music is covered regularly by up and coming artists like Anberlin . Like almost all bands, creative differences lead to New Order’s separation, and individual exploration. Bernard Sumner, whose recognizable vocals have been one of trademarks of these bands, collaborated with Johnny Marr formerly of The Smiths in the early and mid-nineties to form Electronic. They collaborated with the Pet Shop Boys ‘ Neil Tennant and Chris Lowe to create some cool, danceable alternative rock with elements of house. Near the turn of the century, New Order re-united and put out a couple of albums only fans would love. Tensions remained though, and in 2009 they officially called it quits. 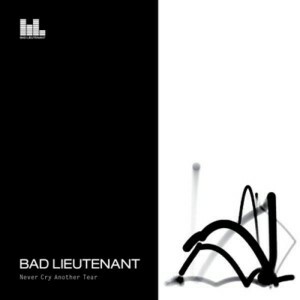 Bernard Sumner then formed Bad Lieutenant with guitarist Phil Cunningham (who joined New Order in 2004) and Jake Evans (vocals and guitar). Contributing to their debut album Never Cry Another Tear are original New Order drummer Stephen Morris, and Blur bassist Alex James. Bernard’s style dominates this album, and his voice quite comforting for long time fans. The album starts off like an Electronic CD, until Jake Evans joins Bernard to sing “This is Home.” At first I was disturbed. Jake’s voice didn’t fit. As I listened, though I began to appreciate it. Jake takes the lead on “These Changes,” and his naturally lower, fuller voice captures the reflective tone of the tune. Every track is pretty good on this album – there are no duds. My favorites, though reminded me of the New Order I grew up with, and Electronic’s debut CD. I’ll miss Peter Hook’s bass. Good bye New Order. Please say hello to Bad Lieutenant . Listen to excerpts without leaving the site!